If the preceding verse is familiar to you, then you are probably already a fan of the Green Lantern. If not, here’s a quick rundown. The Green Lantern Corps are a galactic police force. They protect and defend the innocent and bring the guilty to justice. 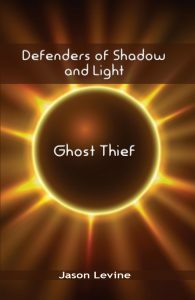 They are given rings which they can use (along with their willpower) to create objects out of a green energy. 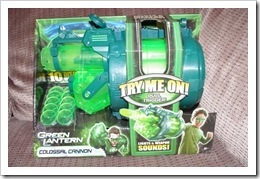 The two toys that I received to review are the Colossal Cannon and a Kilowog action figure. Kilowog won’t be winning any beauty pageants anytime soon, but this member of the Green Lantern corps is a fierce fighter and has a keen mind. 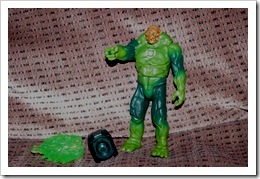 His action figure includes a “blast” green energy construct (which can attach to other constructs) and a Green Lantern ring. 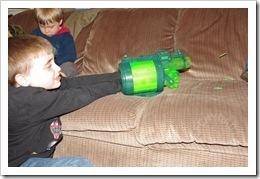 My boys had fun playing with Kilowog, but I’ve got to admit that they were most intrigued by the ring. NHL claimed it as his own and pretended to be a Green Lantern. Of course, he decided to play fair (with some coaching from dad) and allowed JSL to wear the ring a few times. Sadly, the ring was too small for my fingers so I didn’t get to play with it. 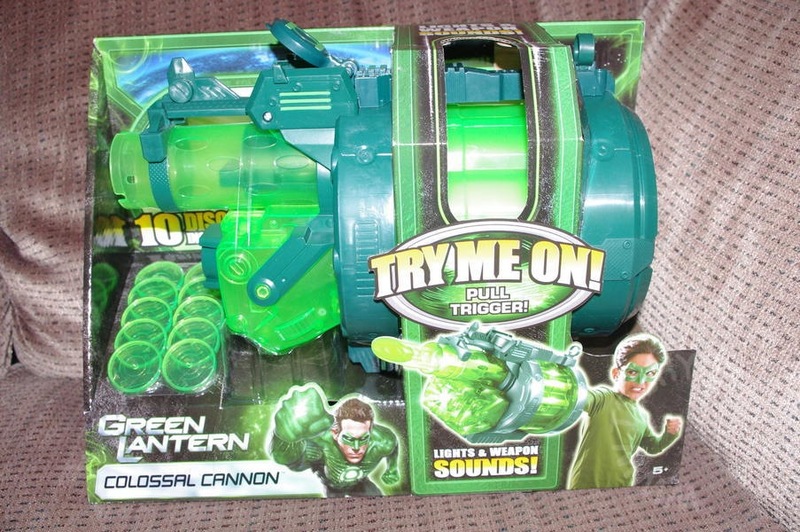 This toy, as the name implies, is a big cannon. 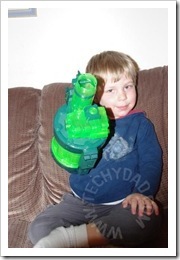 A child (or.. ahem… grownup) puts his hand inside it and pulls on a trigger inside. This fires off plastic “lantern” projectiles, makes the cannon light up and causes it to make firing noises. 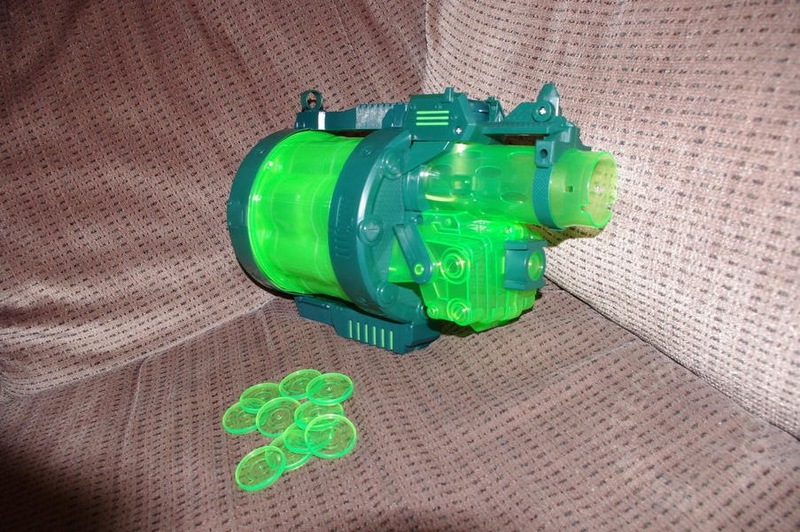 This was a hit and my boys (ahem… and I) kept fighting over who would wield it next. There was just one problem. As you can see in one of the photos, NHL is firing the discs at couch cushions. I rightfully surmised that the cannon’s projectiles could hurt a person and forbade them from using it unless a) it was empty or b) it was pointed at the cushions and away from anyone else. This worked well until one time when we thought NHL had fired all 10 projectiles. 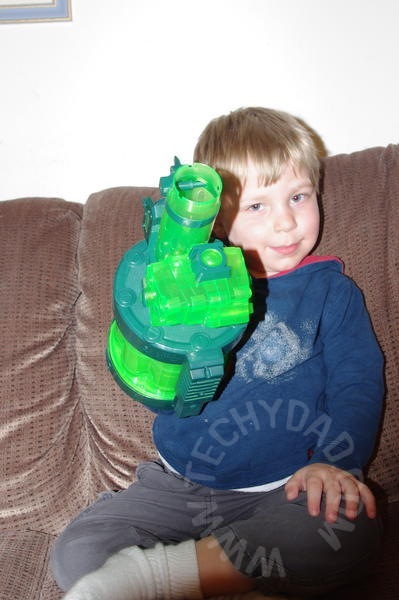 He raised the cannon in the air, squeezed the trigger and out shot a disc. It bounced off our wall and landed without anyone getting hurt or anything being broken. Still, I decided not to risk future breakage and confiscated the discs. I would count this as the only downside to the Colossal Cannon. 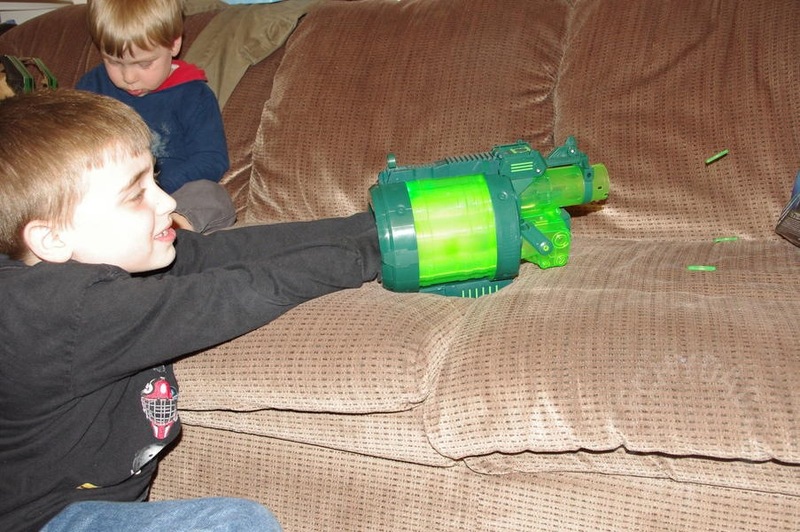 Of course, any projectile-shooting toy bears this risk and this can be easily managed by only giving kids the discs under proper supervision. Even without the discs, the Colossal Cannon is fun. 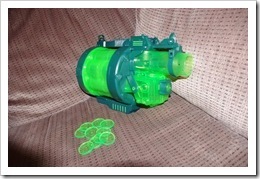 Kids can put it on and imagine that they are a Green Lantern firing blasts at bad guys. 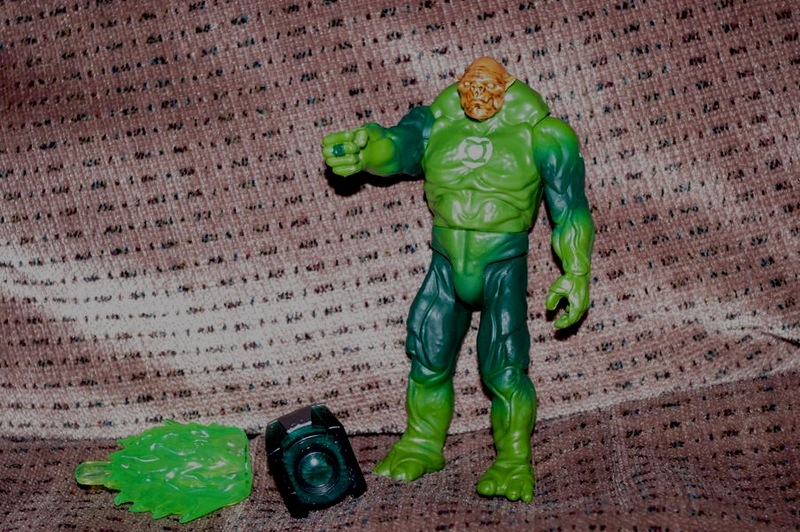 Disclaimer: I wrote this review while participating in a blog tour by Dad Central Consulting on behalf of Mattel and received Green Lantern toys to facilitate my review and a promotional item to thank me for taking the time to participate.